Since we do not have any custom ROMs and CyanogenMod I decided to remap volume buttons on my Alcatel One Touch STAR 6010x because I use it and need that. I did edit on volume buttons like feature on CyanogenMod ROM most of you know what I mean long press to skip song with volume keys. You can switch tracks when screen is turned off & turned on. Switching of tracks is very fast working with most Android music players included stock player. 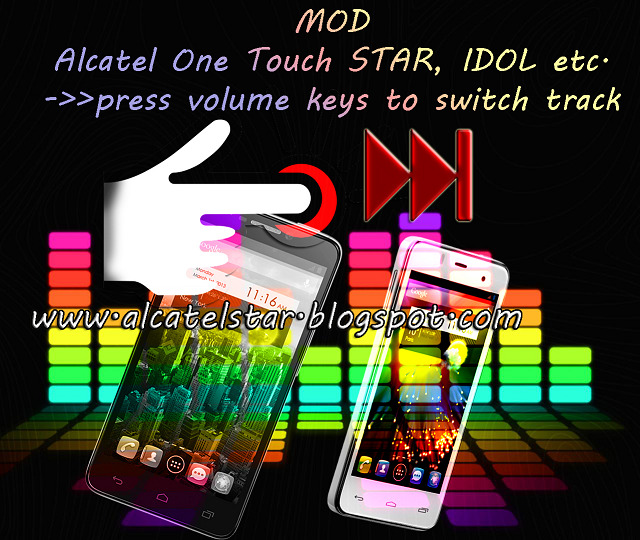 MOD will work on other models Alcatel IDOL, XPOP, MPOP, SPOP etc. DISCLAIMER: We(Alcatelstar.blogspot.com)are not responsible for any damage on your phone after installing this MOD. DO IT AT YOUR OWN RISK!!! I created a flashable.zip that you can easily flash via CWM or TWRP Recovery!!! Reboot & Enjoy on this great mod! If you don't like this mod you can restore to original state here's flashable.zip but again mount system before installing!! !